Images & Apparatus Daguerreotype cameras and images represent the earliest form of commercial photographic apparatus and process. A carefully exposed image made on silver coated copper plates glistens with a tonal range and delicacy that is unparalleled even by today's standards. As with the images, most of the cameras themselves are practically works of art and, in many cases, the earliest are one-off models made by craftsman. It is believed that only 250 (or so) daguerreotype cameras still exist worldwide according to a recognized expert. While most daguerrian equipment takes the form of a box, it was William and William H. Lewis that patented and created the first cameras to use a bellows in 1851. The Lewis family established their business in 1839 and believed to have entered into the daguerreian trade by 1844. 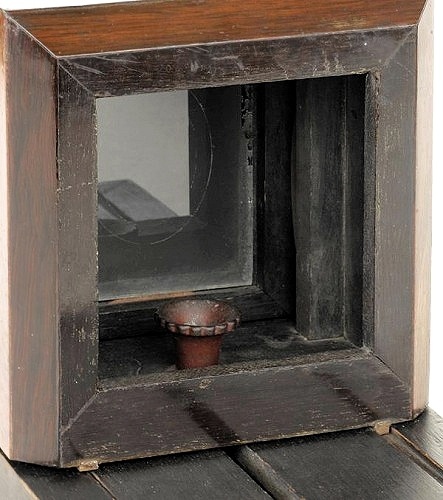 Aaron F. Palmer's and Joseph Longking's bellows daguerreotype camera is practically identical to Lewis' original design; and in many cases, the cameras cannot be properly identified without maker's markings or detailed examination of the tiniest construction details. This is why American bellows daguerreotype apparatus are often referred to as "Lewis-style." Clues might lie in the companies themselves. According to Stuart Wilensky in his well researched 1981 article The Men, The Camera and Their Factory; "in the Doggetts New York Business Directory of 1852-53, Lewis is no longer listed. At their address, 142, Chatham, we find instead, Gardner, Harrison and Company. It appears that Lewis sold out their entire operations." Wilensky speculates that the new company carried on operations under the existing lease with W. & W.H. Lewis. No further references pertaining to Gardner, Harrison and Company were found after 1853. The first reference to Palmer & Longking is found in Humphrey's Journal, January 1, 1853 and a follow up listing in E. Anthony's 1854 catalogue. Palmer & Longking lenses (advertised as cameras at the time) and bellows box apparatus were listed. It is unknown when Palmer & Longking went out of business, but Wilensky notes the company was listed between 1854 and 1858 at the same 142 Catham address as Garner, Harrison and Company according to New York City directories. The Camera The camera shown here is a fine example of a Lewis-style bellows daguerreotype with the original maker's mark and manufacturer's labeled lens. The camera's body is finished with a fine rosewood veneer. A hinged top with ivory/bone knob lifts open to remove or place a ground glass frame and plate holder. This appears to be an early example because all the screws and hinges are steel (not brass) and hand-made square head nails are used at the front corners of the base and to hold the ground glass. While most daguerreian equipment has a variety of lenses (many of which are replacements over time), C.C. Harrison is usually found, however this camera retains its original Palmer & Longking marked radial drive lens (#1390). The chamfered front standard was eventually replaced with a squared front on all later cameras. In contrast to the early forms of this camera, these later cameras also enclose the bellows within the body. Above: Rear view of camera showing the ground glass (with an oval etching for composing the picture for a cased image) and cast focusing knob. 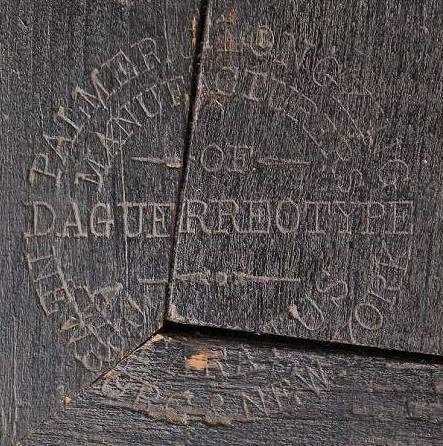 Left: Palmer & Longking maker's mark stamped on the rear bed corner. Suggested Reading I highly recommend a Google search to find Stuart Wilensky's well researched 1981 article entitled: The Men, The Camera and Their Factory: William Lewis, William H. Lewis, Aaron F. Palmer and Joseph Longking.